Company Profile | Kagoshima Shochu Kojika || KOJIKA SHUZO CO., LTD. In order to expand, lower the cost of mass production, and stabilize and improve quality, the 4 companies from Kanoya-shi, Higashikushira-cho, Aira-cho, and Sata started an equally owned cooperative partnership, followed by the establishment of a production section, etc. Completed construction of the factory using approx. 75 million yen.Produced 430kl (alcohol 25% ABV). Begun selling the “Kojika” Kagoshima shochu brand. Two new companies from Kanoya-shi joined the partnership and the capital increased from 8 million yen to 12 million yen. Produced 1,907kl this year and exceeded 10,000 koku* for the first time. Remodeled and expanded factory (cost of approx. 250 million yen) including the addition of a decompression distillation device, storage tank, and sweet potato steaming device. Increased capital to 30 million yen. Installed semi-automatic paper carton packaging device. Exceeded an annual production of 1,907kl (24,000 koku*). 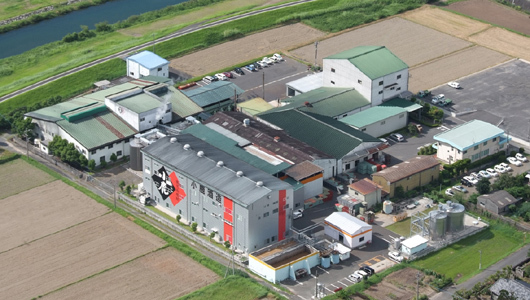 Expanded with a new factory on an adjoining site (cost of 750 million yen) and added a fully-automatic bottling line. Fully automated the paper carton packaging line (2,000 pkg./hr). Established Kojika Agricultural Co-Operative to secure the ingredients (sweet potatoes). Achieved an annual production of 5,400kl (30,000 koku*). Received first place at Kagoshima single distillation shochu evaluating event. Achieved annual production of 6,300kl (35,000 koku*). Company’s 30 year anniversary. Production volume increases 15 times since establishment. After 36 years operating as a co-operative, the company went public. Fully improved sweet potato storage tank, sorting line, and water-waste disposal unit. 39th year of operation (2.3 billion yen in sales/3,0000 koku*). Inauguration of employee stock sharing with 10 million yen worth of newly issued shares, total capital reaches 35 million yen. Completed construction on new warehouse with fully-automated, built in storage rack system. Received excellence award in the single distillation shochu section while representing Kagoshima breweries at the Kumamoto taxation bureau alcohol evaluating event. * A Koku is a unit used to measure the production output of a sake brewery. One Koku equals 180 liters of sake or one hundred isshobin sake bottles.